The Education Department is pleased to announce our Education Training Portal!! We are working on developing over 50 trainings to help you be successful in your classroom to provide high quality care and education. Training topics available include The Creative Curriculum, the Child Assessment Portfolio System, Child Guidance, and MUCH more!! The Education Training Portal will go live the first week of December with 6 trainings available as well as additional resources. We will continue to develop trainings throughout the year and add them to the portal. There is also a quick knowledge test for each recorded training as well as a training verification form. You will need to get these materials form your Director. At this time, the trainings will be approved Rainbow trainings and we will work on getting them approved for all 12 states. Please let us know if you have any questions at education@rainbowccc.com. This is the season where holidays may be celebrated by children and their families. The question is should you celebrate the holidays in your classroom? What are the goals of the celebration? How disruptive is the celebration to your daily routine? How are families and the community involved? Are you avoiding stereotypical depictions? How are the activities connected to the children’s interest and the curriculum? What is your plan for working with children and families who don’t celebrate a holiday? Have you considered children’s lingering interest in a holiday once it has passed? Derman-Sparks & Edwards (2010). Anti-Bias Education for Young Children and Ourselves. Every day is filled with transitions, the period between one routine or experience and the next. The most important transitions, and often most difficult, are at the beginning and end of the day. However, any transition can be a problem if children do not know what to do or if they are required to wait too long. To avoid disruptive behaviors, always give children something to do while they are waiting. Planned transitions help children build a sense of order. They feel competent when they know what is expected and when they are engaged. Plan ahead: Thinking and organizing supplies ahead of time allows you to give the children your full attention. Be organized: Have the supplies for the next activity ready so you do not have to search for them while the children wait. Give clear directions: Make sure your instructions are appropriate for the developmental level of the children. For example, a child who can only follow one-step directions will be confused if you tell him to put the balls in the shed, go inside, hang up his coat, and wash his hands. Avoid having children wait: Divide the group so children will not have to wait. For example, while some 2-year-olds are brushing their teeth, the others might be listening to a story or helping you put blankets on cots. Guide children through transitions: Do this by describing what you are doing or by singing or chanting together. For example, you can have a special song for clean-up time or for getting ready for lunch. Positive Reinforcement is a technique used by parents and caregivers to modify their children's behavior by reinforcing desired behaviors. This technique has proven effective for parents, teachers, coaches, leaders, and anyone responsible for a child or group of children. The fact that it does not use pain, punishment, intimidation, yelling, degradation, humiliation, shame, guilt or other things that can hurt the child, their self-esteem, emotional growth, well-being or their relationship with parent or caregiver has made positive reinforcement popular around the world and used in many classrooms. Positive Reinforcement was pioneered by such giants in the field of psychology as Ivan Pavlov, Edward L. Thorndike, John B. Watson and B.F. Skinner. Pavlov is familiar for his experiments with dogs salivating when hearing a bell which they had been conditioned to associate with food. His work uncovered what came to be known as classical conditioning. 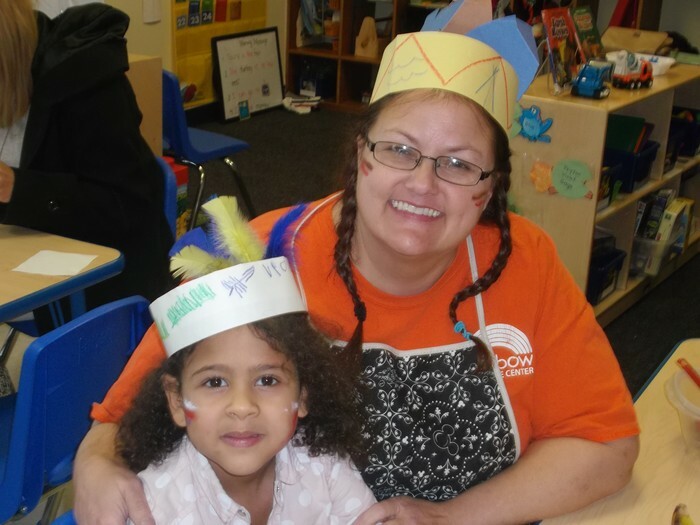 Ms. MarJo is the lead Pre-K Academy teacher at the Rainbow Child Care Center in Leo, Indiana. She has over 9 years of experience in early childhood and chose this field to be a trusted caregiver and educator of a family’s most important treasure their child. She loves preparing our Pre-K Academy children for Kindergarten and paving the way for a successful school journey. Ms. Marjo is an exemplary teacher who demonstrates compassion and high quality education everyday in her classroom. Thank you Ms. Marjo! !